Movie posters that are vintage original release posters are quite rare and collectible. They are also fun to collect and display. One reason is the wonderful graphics. Another reason is that movie posters come in many sizes. A standard lobby card is 11″ X 14″. A window card measures 14″ X 22″. An insert poster is 14″ X 36″. This is a really nice size. They display really well. A pair of insert posters can really frame a wall or bay window on either side. This is an example. It is an original insert movie poster from 101 Dalmatians – 1961. Next is a half sheet poster which is 22″ X 28″. The most desirable posters to most collectors are one sheet movie posters. They measure 27″ X 41″. Often, looking at a great one sheet poster is like gazing through a window into another world. Now we start getting into large sizes. Any of these larger posters are quite impressive when framed and exhibited. A three sheet movie poster measures 41″ X 81″. A six sheet is 81″ X 81″. Finally a twenty four sheet poster is usually used on a billboard. That measures 108″ X 246″. There are even more sizes in between. Cartoon movie posters are not actually animation art. They were not used in the production of a film. They of course were used to advertise and promote them. Really vintage movie posters from the 1940′s and earlier can be incredibly rare. For many early films there can be only a only a small handful of movie posters known to exist. Even though there were certainly hundreds or more of many posters produced, for some films there are no known copies. 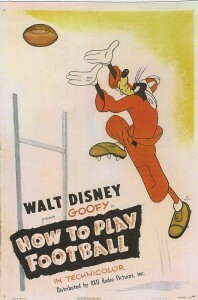 Walt Disney Studios produced a series of “How to” cartoons starring Goofy. Many of them were how to play different sports. How to Play Baseball, How to Swim and How to Ride a Horse are a few. In 1944 Disney released How to Play Football. The poster is quite striking as you can see at the right. This poster has only one known copy. These movie posters were used at a theater, then folded up and sent to the next theater or just stored away. No one really thought at the time that they were collectible in any way. Anyway, over the years all copies except this one were lost or thrown away. Vintage cartoon movie posters are collectible because they have a natural scarcity. This is true about all objects that are truly collectible. If something is created with the plan to have it be collectible the odds are that it will never truly become collectible. It is the things that attain this natural scarcity kind of by accident that become really collectible.